Tropical forests around the world play a key role in the global carbon cycle and harbour more than half of the species worldwide. However, increases in land use in recent decades caused unprecedented losses of tropical forest. 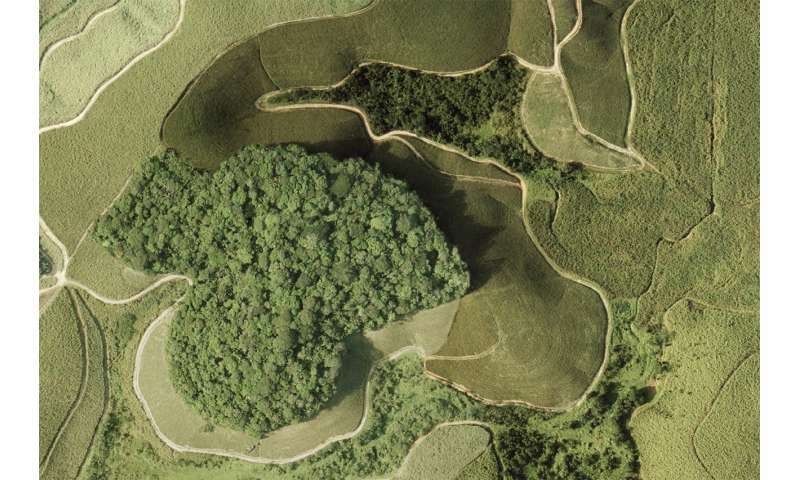 Scientists at the Helmholtz Centre for Environmental Research (UFZ) have adapted a method from physics to describe the fragmentation of tropical forests mathematically. In the scientific journal Nature, they explain how this allows them to model and understand the fragmentation of forests on a global scale. They found that forest fragmentation on all three continents is close to a critical point beyond which the fragment number will strongly increase. This will have severe consequences for biodiversity and carbon storage. In order to analyse global patterns of forest fragmentation, a UFZ research group led by Prof. Andreas Huth used remote sensing data quantifying forest cover in the tropics in an extremely high resolution of 30 meters, resulting in more than 130 million forest fragments. To their surprise, they found that the fragment sizes on all three continents have similar frequency distributions. For example, the number of forest fragments smaller than 10,000 hectares is similar in all three regions—11.2 percent in Central and South America, 9.9 percent in Africa and 9.2 percent in Southeast Asia. "This is surprising, because land use noticeably differs from continent to continent," says Dr. Franziska Taubert, mathematician in Huth's team and first author of the study. For instance, very large forest areas are transformed into agricultural land in the Amazon region. By contrast, in the forests of Southeast Asia, economically attractive tree species are often taken from the forest. When searching for explanations for the identical fragmentation patterns, the UFZ modelers found their answer in physics. "The fragment size distribution follows a power law with almost identical exponents on all three continents," says biophysicist Andreas Huth. Such power laws are known from other natural phenomena such as forest fires, landslides and earthquakes. The breakthrough of their study is the ability to derive the observed power laws from percolation theory. "This theory states that in a certain phase of deforestation the forest landscape exhibits fractal, self-similar structures, i.e. structures that can be found again and again on different levels," explains Huth. "In physics, this is also referred to as the critical point or phase transition, which for example also occurs during the transition of water from a liquid to gaseous state," added co-author Dr. Thorsten Wiegand from UFZ. A particularly fascinating aspect of the percolation theory is that this universal size distribution is, at the critical point, independent of the small-scale mechanisms that led to fragmentation. This explains why all three continents show similar large-scale fragmentation patterns. The UFZ team compared the remote sensing data of the three topical regions with several predictions of percolation theory. In support of their hypothesis they found agreement not only for the fragment size distribution, but also for two other important indicators—the fractal dimension and the length distribution of fragment edges. "This physical theory allows us to describe deforestation processes in the tropics," concludes Dr. Rico Fischer, co-author of the study. This approach can also be used to predict how fragmentation of tropical forests will advance over the next decades. "Particularly near the critical point, dramatic effects are to be expected even in the case of relatively minor deforestation," adds Taubert. Using scenarios that assume different clearing and reforestation rates, the scientists modeled how many forest fragments can be expected by 2050. For example, if deforestation continues in the Central and South American tropics at the current rate, the number of fragments will increase 33-fold, and their mean size will decrease from 17 ha to 0.25 ha. The fragmentation trend can only be stopped by slowing down deforestation and reforesting more areas than deforesting, currently an unlikely option. Future satellite missions, such as Tandem-L, are of great importance for the timely and reliable detection of these trends. Advanced fragmentation of tropical forests will have severe consequences for biodiversity and carbon storage. Biodiversity suffers because numerous rare animal species depend on large forest patches. For example, the jaguar needs around 10,000 hectares of contiguous forest to survive. The increasing fragmentation of forests also has a negative impact on climate. A UFZ team led by Andreas Huth previously described in Nature Communications that fragmentation of once connected tropical forest areas could increase carbon emissions worldwide by another third, as many trees die and less carbon dioxide is stored in the edge of forest fragments. Targeted forest regeneration: A blueprint for conserving tropical biological diversity?